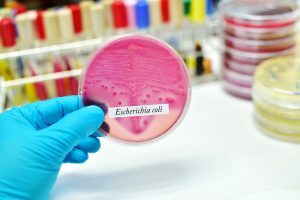 As of April 10, 2019, at least 17 people in Georgia have confirmed cases of E. coli infection, and these cases are linked to a larger multi-state outbreak involving nearly 100 people in 5 states. Because the investigation is ongoing, the number of cases will likely rise. The Centers for Disease Control and Prevention, the Georgia Department of Public Health and other agencies are working to uncover a common source of the infection, such as a specific food item, grocery store or restaurant chain. Public Health is interviewing the people who became ill, asking them about foods they’ve recently eaten and any other possible exposure they could all have in common. If you are experiencing these symptoms, you should see your doctor. Young children, the elderly and people with weakened immune systems are most at risk for developing complications from E. coli infection. For more information about E. coli O103, log on to https://www.cdc.gov/ecoli/index.html. For more information about safe food handling and preparation, log on to https://www.foodsafety.gov/keep/basics/clean/index.html.